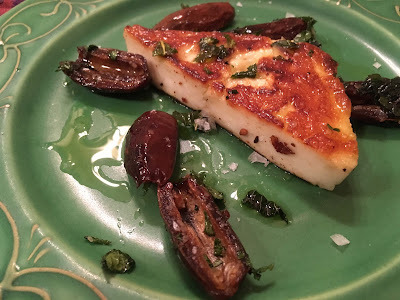 You may be familiar with Halloumi, on Greek restaurant menus it’s called saganaki. It's a salty semi-hard cheese that because of its unusually high melting point is amazing for grilling. There’s nothing quite like its warm, chewy goodness. Place a large pan over medium high heat then halve the square of cheese diagonally. Once your pan is hot add a small splash of olive oil followed by the two triangles of cheese and cook until well browned on both sides. You could also grill it on the barbeque, either way, turning occasionally it will take about ten minutes. As an appetizer you can simply serve it with a drizzle of your best olive oil, lemon juice, a bit of chopped mint, sautéed garlic, or some caramelized dates or apricots. It’s also a delicious addition to a warm or cold salad. And because it freezes well you can always have one on hand for a spontaneous halloumi fix.